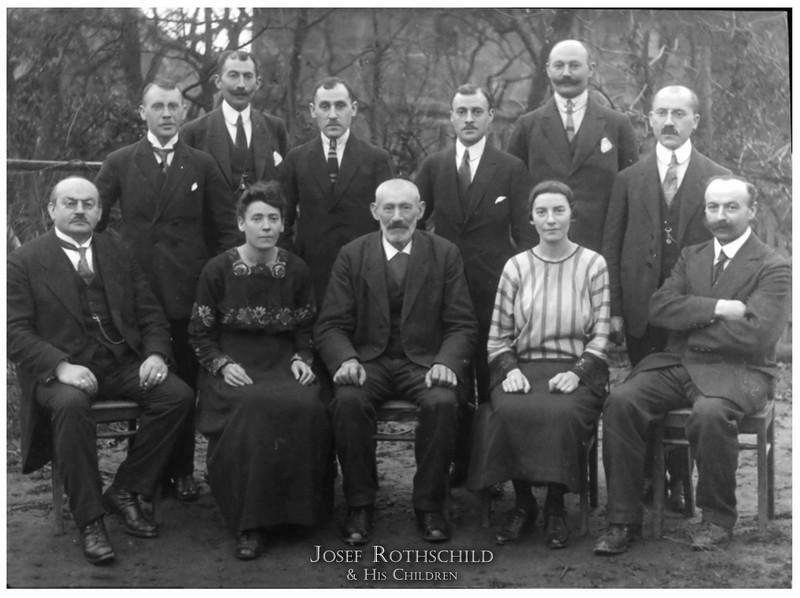 RS001 |The Rothschild Siblings, with father Joseph seated in the middle, we believe on the occasion of his 75th Birthday (probably 1928). SESSI, b.27 Jul 1883, d. 2 Aug 1965 in NY (born with twin who did not survive), married Adolf Hecht, both survived four years in the Theresenstadt Concentration Camp. Children, Arthur and Frieda (married Levi) and Paula (went to Israel as a teen). Sessie emigrated to the US in 1946. MALI (b.6 July 1892-1943, Auschwitz), remained with her father and was likely killed in Auschwitz. MORITZ (b 24 Nov 1877, d. 1943, Auschwitz), married Johanna Seligmann, 3 children, Siegbert (b.1911, d. Israel 1963); Philipine (b.1916; d. East Berlin, 1988); Babette (m. Henry Windmuller; b.1919; d. NC 2009). SIMON (b.22 Dec 1885, d.24 Oct 1950, NY), married Jena Bendorf (1887-1958), had three sons: Ernest, (1913-1981); Walter (1917-2000), Otto (1919-1975). SALLI (Solli) b. 26 Aug 1879, married Bertha Lederer (b.1901), 2 sons, Fred & Helmut. Josef Rothschild was the son of David Rothschild, who was born 24 January 1815 and died 28 June 1885. According to the town of Hoerstein's registration certificate, Josef was born 1 Jan 1853 and Philippina Hamburger was born 26 Jan 1856. The photograph was taken in Hoerstein, their hometown. Malli remained with her father; they retreated to Holland (Amsterdam) where Daniel had arranged for a house. Sam Adler was told by neighbors after the war, that the Nazis came to take the house as their headquarters for that region. Josef, at 92 or 93, refused to leave the house, struck the officer over the head with his cane, killed him, and was then shot dead in the house. However, the Yad Vashem database lists a "Joseph Rothschild" from Hoerstein born in 1853, as "Listed of the murdered Jews from the Netherlands." We are still working to sort out the facts.